"A bad day fishing is better than a good day at work!" This individual loves all the paraphernalia of bass fishing be it rods, reels, plugs, soft bait, fishing equipment, fishing tools, bass boats, fishing line or anything else one can collect, manipulate, create or use to fish for and catch largemouth and smallmouth bass, or when weather fails, diddle with in their own private "Bass Bum Tackle Lounge". "Bums"savor early mornings on lakes, rivers and reservoirs and the quite solitude and peace they bring. They realize a sense of calm in watching the sun set while sitting in their boat with line in water. They marvel at the soar of an eagle above them or the cry of a loon unseen somewhere on the lake. They thrill in the smashing strike on a topwater lure and the anticipation and excitement that comes with a slight tick or a jarring thump of their line. They experience a sense of extreme elation and expectation as they fight the unknown struggling on the end of their line. They look intently at the water for that first flash of white when the bass is "up", close enough for that first glimpse, and they exalt in yelling to their fishing partner, "It's a hawg, get the net", even when it may not be. They delight in returning to the dock or cabin at days end to share stories about bass they caught and the big ones that got away. They enjoy cooking an evening meal as a group effort while having a few brews or perhaps a bourbon in a plastic cup with their fishing buddies, friends all. A day drifting the river seeking smallmouth and "spots" in holes or current temporarily erases from their mind all matters, demanding or troubling, as they focus on nothing but the present. They become enveloped in a quiet repose. They find calm and serenity in the environments where bass hang out, as they are never lacking in beauty. They get great satisfaction from trying to outwit a creature whose formidable survival skills have been honed over a thousands of years. They enjoy sharing a day in a boat with a good friend, when conversation may be minimal and there is solitude without loneliness. 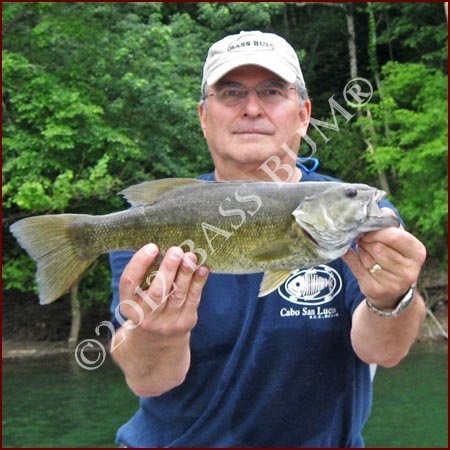 Bass fishing removes them from the gathering places of crowds that are at times, simply ugly. They fish because it takes them away from a daily regimen of things they may dislike intensely but are trapped in doing by society's demands. They fish quite simply, for the pure joy of it. My fishing buddies and I are Bass Bums®. Come along and meet a few of us. This guy is me. Affectionately known as "Purd". I am not just passionate about bass fishing, I'm consumed by it. I'm a junk fisherman. I'll try any technique, tackle, or lure as a "student" of this great sport. I spent 30 years in the world of marketing, selling, manufacturing and distributing medical and surgical products. This fellow is "Mitch", though some call him the "Commish". That smile on his face is due to the largemouth in his hands that weighed in at seven and a half ponds. He caught it on a Shallow Shad Rap in water less than three feet deep. Mitch is our "live bait" guru. He knows more about "minner" fishing than most any man I know. Mitch spent the last three decades in law enforcement retiring from the FBI a couple of years ago. A great cook whose specialty is meat, especially pork loin and ribs. This gentleman is "Elmo". He is an attorney with a predilection for bass fishing rivers. Thus, he is our "river specialist". Though he likes lake fishing his first love is floating a river. A glass of Irish whiskey and a good cigar make him happy, though beer works just fine too. To the right is a Bass Bum known as the "Judge". Not sure why, he has never been a judge, though he is an attorney. The name just seems to fit. He has an appreciation for well seasoned food, beer and a good cigar. He is also a very good cook upon whom we often rely. This former college co-ed is our first lady Bass Bum. She graduated from college this year and entered the world of gainful employment leaving the carefree world of college life behind. 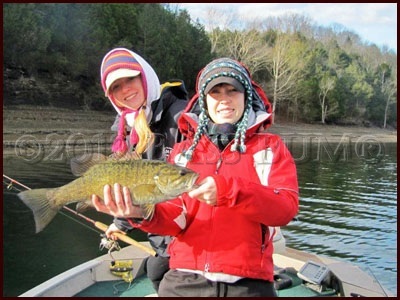 She is an excellent bass angler as well as an outstanding golfer. It's embarrassing to admit, but she manages to consistently beat the other fellas on this page in both sports. 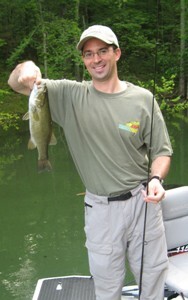 This guy, a regional manager for a medical products company, is a "fly rodder" for trout first and a bass angler second. All he needs to do is shift that love of fly fishing for trout to fly fishing for smallmouth. Now that's an exhilarating combo. A graduate of The University of Tennessee and lover of rock climbing and snow skiing. 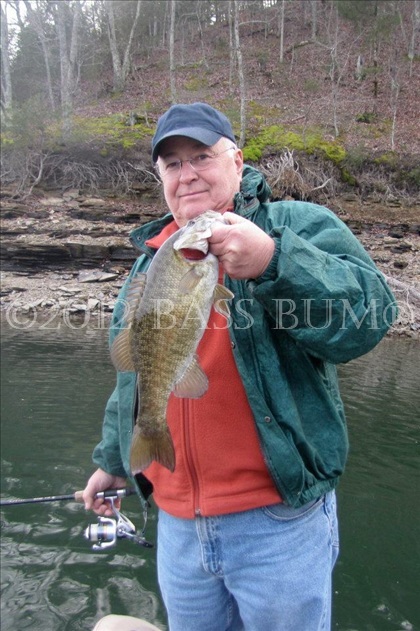 Grew up bass fishing the Stones River and Center Hill Lake, but now he's a Dale Hollow smallmouth nut. He loves fishing and the fellowship that goes along with the trips. He is the master of allegory never failing to entertain the rest of us when relaxing in the evenings with a good meal and a beer. An icy cold Bud is his favorite brew! This is big Bart's progeny. He's an outstanding member of the Lambuth University baseball team in his senior year. It's not unusual for him to out-fish his dad and most of the other Bass Bums! 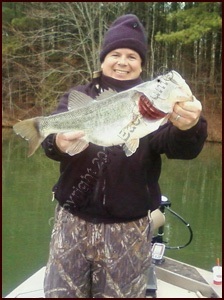 Check out the 24 1/2" largemouth caught here in Tennessee July 20, 2009. He didn't have a scales with him but it had a 16" girth. You can do the math. 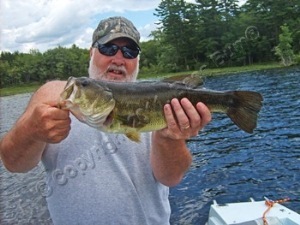 This is Dave Tolman, a Bass Bum from Maine, holding a fat 20" largemouth he caught out of Great Pond, Belgrade, Maine last June. Unfortunately, where Dave comes from bass fishing is limited to the period between late April or early May through September. 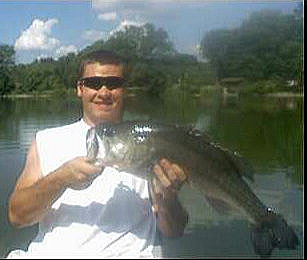 Trent, the Bass Bum holding the largemouth hawg shown at right (over five for sure but no scale), is one of the sales and management crew at Clark Marine in Franklin, Tennessee. 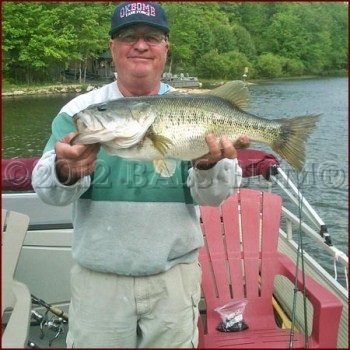 He is not only a good salesman that understands the needs of bass boat owners and the importance of post sale customer service (Mitch and I bought our Triton from him), he is also a good bass fisherman as well. Trent caught this big gal the second week of March 2011 on a cold day, in shallow water and with water temperature in the low 50's. 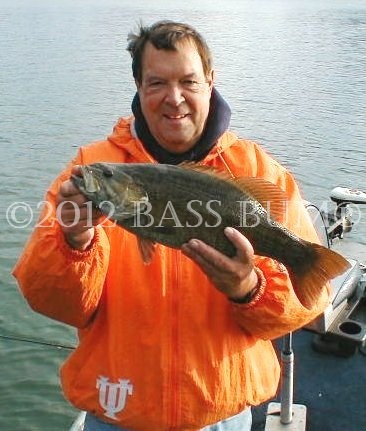 This big bass fell for a Lucky Craft Pointer SP 100, Table Rock Shad color. Bass Bums® come in all shapes and sizes and from every background. Male, female, blue collar and white collar. No matter their background they all share a common passion for chasing after largemouth, smallmouth and spotted bass. Let us know about your passion for bass fishing. We'd like to add you to our gallery of Bass Bums. Share pictures of bass you've caught like those above. 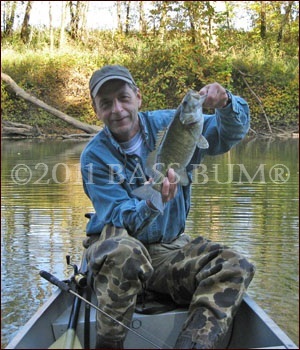 Send in largemouth bass pictures, pictures of smallmouth bass and even spotted bass. Join the Bass Bum® ranks.